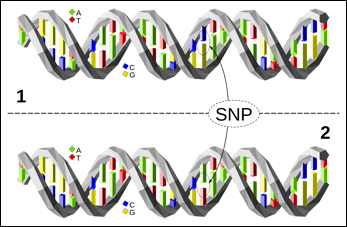 Today’s term, for DNA Sunday, is SNP. It’s an acronym, short for Single Nucleotide Polymorphism. Which, all in all, is such a mouthful that it’s no wonder it got shortened to SNP. So SNPs help us figure out exactly where we belong — on what branch of the human family tree — and who else ought to be hanging out on that branch with us. Something to get snippy about, for sure. Thanks, Judy. This is a very good explanation for everyone but, especially for beginners trying to make sense of all the terminology they are being bombarded with as they try to understand their their results, etc. I am forwarding to our new DNA SIG group.